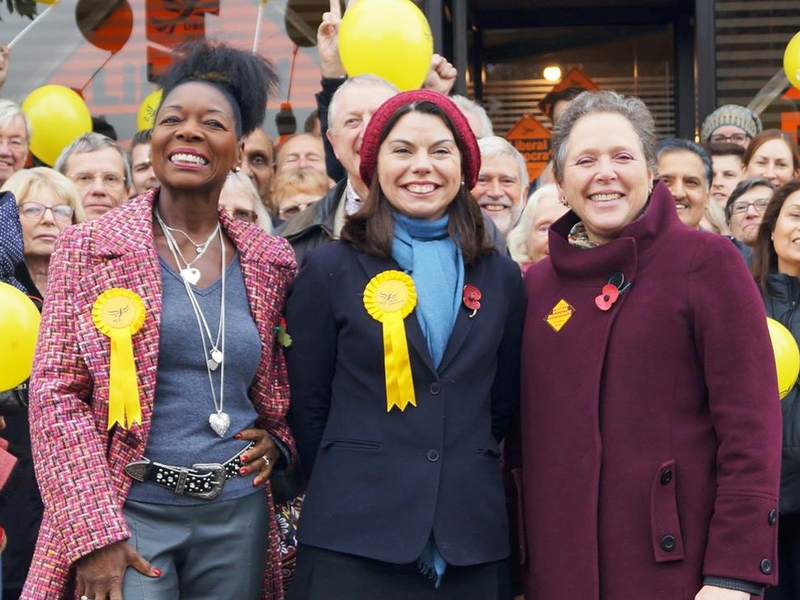 Another amazing by-election result for the Liberal Democrats has seen them elect Sarah Olney to Parliament, sending a thumping message to the Conservative Government. Sarah will be the new MP for the former Conservative strong hold of Richmond Park after she overturned a huge 23,000 vote majority to win. Liberal Democrat support is now growing across the country as they show they are now the only party standing up against hard brexit and for a properly funded NHS. Many traditional Conservative and Labour voters are now switching to back the Liberal Democrats because of their clear, positive message on Brexit and the NHS. Three reasons to get involved NOW! 2. We’re also fighting to make sure the NHS has the cash it needs! 3. If you don’t fight for what you believe in who else will? As the polls closed and the ghastly General election results rolled in people began to realise that liberalism is still a cause worth fighting for. The national total of new members is rising all the time. It’s around 11,000 as I write and many of these are under 30. The running total is here. I think I grew up thinking that Liberalism seemed a sensible way of going about things, even though my father is a lifelong Tory. I was drawn, to some extent, towards socialism in my teens, appalled by the mean divisiveness of Thatcherism but always admired the Liberals, SDP and Lib Dems, having the greatest respect for Shirley Williams, Paddy Ashdown, Charles Kennedy and others, with their ever sensible contributions to debate. I’m afraid I took some notice of the “wasted vote” disincentive for voting Lib Dem, even when I would like to have done so, until the national disgrace of the 2003 Iraqi invasion, at which point I vowed never to vote for anyone who had supported that outrage. What a desperate shock, and I share the immense sadness and disappointment of all Liberal Democrats at the devastating losses, followed by Nick Clegg’s resignation as leader. I agree with the statement on the party website that it is now more important than ever to have a strong central party to protect and promote liberal ideals and I would like to offer whatever support I am able towards that end. VoteSmart has declared that Liberal Democrat candidate Grace Weaver is the only choice for change in South Suffolk. Liberal Democrats polled 31% in 2010, while Labour polled only 14% in the constituency. Grace, who grew up in East Bergholt is an Oxford graduate currently working as a consultant advising health and disability charities. She commented “Only the Liberal Democrats can deliver the focus on education, affordable housing and transport that South Suffolk desperately needs.” More details on the South Suffolk Lib Dem website. Have you had this leaflet? If you haven’t received Grace’s General Election leaflet please let us know – as Royal Mail have failed to deliver in some areas. This is what it looks like. Please email us libdemssouthsuffolk@gmail.com with your postcode if you haven’t received it. We are gathering evidence to take action against Royal Mail. If you’d like to see the whole leaflet it’s here. Vote Kathy and Sue for Babergh! Babergh and Mid Suffolk councils are consulting on a joint Local Plan for the two Districts. This is a chance for residents and businesses in both council areas to have their say on future planning. The recently adopted planning blueprint for Babergh has identified that 300 new homes should be built each year to fulfil demand across the District council’s area. Most of that development is scheduled to take place in the more urban areas – on the fringes of Ipswich and in Hadleigh and Sudbury, with larger villages also taking some development. The redundant Brett Works site in Hadleigh, which has been the subject of a number of unsuccessful planning applications for a supermarket. Ideas for the future of the site are now being sought. Whether hamlets and small villages which are currently not permitted to have new dwellings be allowed some small scale development where there is identified housing need. The consultation is open until March 31st 2015. Happy New Year! Here is the report to Mid Samford parishes, comprising Capel St. Mary, Holton St. Mary, Stratford St. Mary and Little and Great Wenham. Babergh’s planning committee unanimously refused permission for a 130m high wind turbine on land at Wherstead. This is a landmark decision for the council. Many people felt that the scale and environmental impact of this single wind turbine was not justified. English Heritage objected saying “English Heritage considers that there would be harm to the significance of the churches at Wherstead, Belstead and Copdock and to Bentley Old Hall and Freston Tower.” In addition there were objections from the Dedham Vale Society, Suffolk Preservation Society, Suffolk Coast and Heaths, parish councils and many individuals. There were 644 letters or emails with representation, with 639 of those objecting to the proposals. The Ministry of Defence said that the turbine would “cause unacceptable interference to the ATC (Air Traffic Control) radar at RAF Honington”. The maximum power output from this turbine would be 2.5MW. Compare this with the Greater Gabbard offshore wind-farm near Lowestoft which has a maximum output of 504MW with a further extension planned, generating another 504MW. Offshore wind-farms do not seem to generate the same level of opposition as onshore turbines in high visibility locations, as in this case. The applicant, Partnership for Renewables, is likely to appeal. At this time of year there are so many bills to pay. People on low incomes may be tempted to take out expensive loans for essential items like cookers and washing machines. It is shocking to see TV advertisements offering “payday loans” with interest rates of up to 1,000%. Many people don’t realise that they can borrow money from the Credit Union in Suffolk at very reasonable rates. Recently renamed “Eastern Savings and Loans” they have opened premises in Ipswich at 58 Westgate Street. Their website gives details of their opening hours: http://www.eslcu.co.uk/. Last July we reported that a survey of council tenants in Babergh revealed that hundreds felt they need advice and information about dealing with household expenses, as well as ensuring that they are receiving the right amount of benefit. As the song says Christmas may be “the most wonderful time of the year” but it is also the most wasteful. The cost of the food we throw away over the Christmas period is estimated at £64m – including 74 million mince pies (source Unilever). Baroness Ros Scott, who lives in Suffolk, chairs an influential House of Lords EU Scrutiny Committee. The Committee recently published a report showing that the average household in the UK is throwing away the equivalent of 6 meals worth of food every week, at an approximate cost of £20. That’s more than a thousand pounds a year. Supermarkets are also throwing out food that does not meet the size or colour standards they have set. The organisation WRAP has more information on how we can all reduce food waste. Following a bid submitted to the Government’s Additional Housing Revenue Account (HRA) Borrowing Programme, Babergh and Mid Suffolk councils have been granted approval to borrow a further £5.5m, above our Housing Revenue Account borrowing limits. They are among just 21 councils nationwide to have been successful in gaining this extra borrowing power. For us this means that by the end of 2017 Mid Suffolk and Babergh councils will be able to build 60, much needed, homes for rent. The councils have been working closely with Suffolk County Council to use sites they own and need to develop. There will be more detailed plans in the New Year including the locations, proposed plans and timescales. Rail users may want to add their views to the current consultation taking place about the Anglia rail routes. This can be found here. We understand there are proposals that might particularly affect users of the Peterborough/Ely services. Norfolk and Suffolk Mental Health Trust has hit the headlines in recent days as the union Unison has lodged an official complaint about the “radical reorganisation” of services which is currently underway. The Trust provides a range of mental health services including alcohol treatment, learning disability and eating disorder services. Due to growing demand and financial constraints – it has to make savings of £40m by 2016 – the Trust has had to look in a radical way at how it delivers its services. Health Scrutiny committee members were very concerned about this radical redesign of services when they first looked at the issue last year. The new bodies responsible for commissioning mental health services in Suffolk are also keeping a close watch on the performance of the Mental Health Trust. Here are links to some of the recent stories, including a website dedicated to highlighting the problems, which is run by a group of volunteers. On October 1st 2012 Serco took over as the new provider of community healthcare services in Suffolk. This is a three year contract. The contract is managed by the Ipswich and East Suffolk Clinical Commissioning group (CCG) and West Suffolk CCG. These two bodies are the successors to NHS Suffolk, which was abolished in April 2013. When Health Scrutiny first looked, in 2012, at the changes to be brought in by the new provider of community health services there were a number of concerns about reductions in the number of district nurses and occupational therapists. Serco seem to have taken these concerns on board and performance looks better – at least on paper! The community equipment service is also experiencing problems with delays in providing equipment. This service is jointly provided by Suffolk County Council and Suffolk Community Health. We hope that the delays are now being addressed. A representative from the West Suffolk CCG commented that Serco had taken over a poorly performing service. However in December 2013 Suffolk Community Healthcare had met all its response time targets and views of patients were positive. Staff morale is still low – as it is across the rest of the NHS. Suffolk Community Healthcare employ 924 people and have now partnered with Bromley Healthcare, a social enterprise which is highly rated by staff. NHS England (East Anglia) has been working on a project to implement a single specialist surgical centre for patients with liver metastases (secondary cancer of the liver). This centre would cover people living in Suffolk, Norfolk, Cambridgeshire and north Bedfordshire. The National Institute for Clinical Excellence recommends that a liver metastases service should cover a population base of at least 2 million people. This is to ensure that sufficient expertise is built up by the team involved. Reorganisation of such services is always controversial as it means that patients (and their relatives) have to travel further for treatment.